Latvia - 1.Liga SS'2016 by Weiry New! Moldova - National Division SS'2016/17 by map788 New! Spain - Segunda Division B Grp4 SS'2016/17 by shooto Relink! Republica Dominicana - Liga Mayor SS'2016 by karamel New! Austria - Bundesliga SS'2016/17 by schweigi New! Spain - Segunda Division B Grp2 SS'2016/17 by shooto Relink! Spain - Segunda Division B Grp3 SS'2016/17 by shooto Relink! Czech - First League SS'2016/17 by Whydack Relink! Sweden - Superettan SS'2016 by Yoz Relink! Norway - Tippeligaen, OBOS-ligaen, Second Div & Lower Div SS'2016 by einherjer83 Relink! When Portugal pack will be ready? Thanks! First of all, why is no one respecting other peoples w.i.p's anymore, these kinds of things makes me want to quit kitmaking. • Kitspack home/away for 18 team's. • Alternative kits for GKS Katowice II, KS Panki and Ruch Radzionków. • Installation Instructions in the package. • Alternative kits for Gwarek Ornontowice. Poland - 4. liga Group 1-21 (dolnośląska, kujawsko-pomorska, lubelska, lubuska, łódzka, małopolska, mazowiecka, opolska, podkarpacka, podlaska, pomorska, śląska, świętokrzyska, warmińsko-mazurska, wielkopolska, zachodniopomorska). Malawi - TNM Super League SS'2016 by Armagedon55 New! Malaysia - Liga Fam SS'2016 by Yoz New! Fiji - Vodafone Premier League SS'2016 by karamel New! Austria - Erste Liga SS'2016/17 by schweigi New! Poland - 4.Liga Group I & II SS'2016/17 by Whydack New! Spain - Segunda Division B Grp I SS'2016/17 by shooto New! Wales - Dafabet Premier League SS'2016/17 by Armagedon55 New! England - Isthmian Premier League SS'2016/17 by frankthetank87 New! Spain - Segunda Division B Grp III SS'2016/17 by shooto Relink! 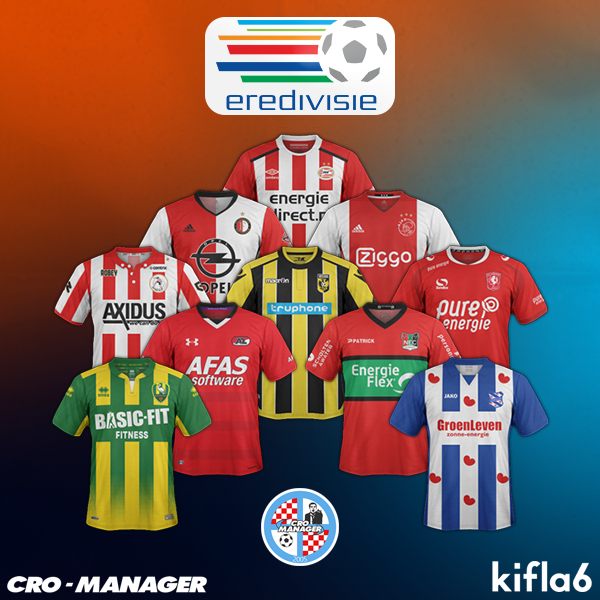 Holland - Eredivisie SS'2016/17 by kifla6 New!